Current mood: Henry in this movie now. UPDATE: And here's Mr. badass himself! sammysheikog: "Still pretty happy after a long day on set with The Man of Steel himself @henrycavill #fun #happiness#sandcastle #film #actor #actors #superman#manofsteel #amman #jordan"
Thank you to Sammy Sheik for the pic. 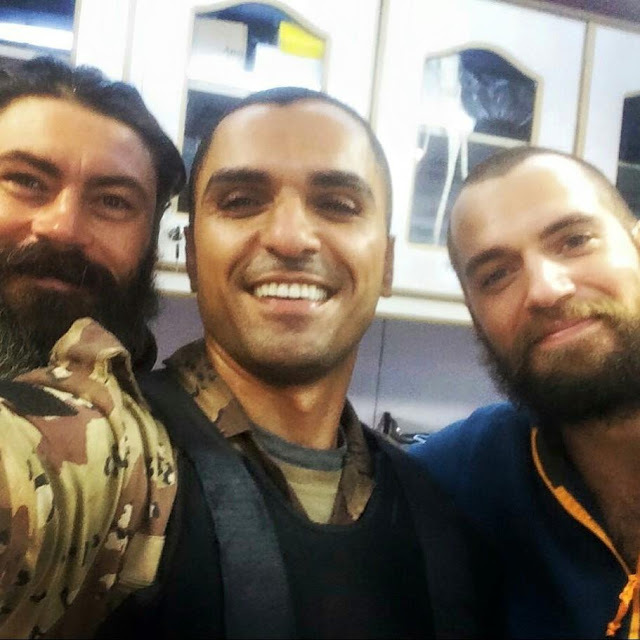 Henry has been in Jordan for a few weeks now, and we have gotten a few glimpses of him -- but this is the first time he poses for a selfie.. and it's great to see that smiling face. Production is set to wrap by January 2nd. We'll continue to bring you updates from Jordan as they come in. I love men in uniform. Yum!! The actor in the middle of this picture has beautiful teeth! !